Now Save $4.95 or 16.5% off Retail Price! 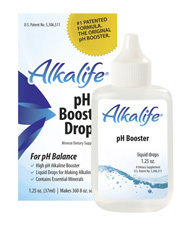 AlkaLife® pH Booster Drops, by Sang Labs Inc., are a patented alkaline concentrate developed by Sang Whang, a revolutionary scientist, engineer and inventor. He developed this product as a convenient way to alkalize the water you drink and support the body's natural ability to eliminate acid waste from the body. Mixing 3 drops of AlkaLife® solution to a glass of ordinary drinking water raises the pH significantly, and when consumed, produces buffering bicarbonates which are easily absorbed into the bloodstream. AlkaLife® contains a patented ratio of potassium and sodium hydroxides to maintain the proper mineral ratio in the body. The foods we eat give us energy by oxidizing, but afterwards they become waste products. Since our body cannot get rid of all the waste it produces, they go somewhere in the body. It is a known fact that this accumulation of non-disposed acidic waste is unhealthy for the body. Examples of solidified acidic waste include cholesterol, fatty acids, kidney stones, urates, sulfates, and phosphates. The best way to support the natural acid/alkaline balance of the body is to drink alkaline water. AlkaLife® is a perfect way to introduce yourself to the benefits of drinking alkaline water before purchasing a water ionizer, which initially requires a much higher capital outlay. The 1.2 oz bottle can be conveniently carried in a pocket or purse and used anytime, anywhere. "A friend of ours told us about the benefits of alkaline water. We have been faithful user of your AlkaLife® product ever since. Also, we've introduced it to our friends and family. AlkaLife fits in with our holistic approach to healthy living. Thanks!" Important Link: Click here for our article on 4 Steps to a Healthy pH Balance. Serving Size: 3 drops in an 8 oz. glass of water. Ingredients: (per serving) Potassium (as potassium hydroxide) 9.8 mg, Sodium (as sodium hydroxide) - 3.3 mg, Distilled water. Suggested Use: Squeeze 3 drops of AlkaLife® solution into an 8 to 10 ounce glass of water. Stir before drinking. Drink 4 to 6 glasses of treated water daily. Warning: Keep out of reach of children. D o not drink AlkaLife pH drops in concentrated form. Keep AlkaLife pH drops away from skin and eyes. Do not exceed the stated dose. Do not expose it to direct sunlight.